At the end of July I was contacted by M&S and asked if I would like to take part in a campaign all about style milestones, I was hugely honoured to be asked to compliment the main campaign which included some very high caliber bloggers (you can see their video and photo shoot here that took place at M&S HQ). Personally as a 40 something mum of two little ones, I was thrown a hugh curveball over 5 years ago, soft play centres, mummy/toddler groups and high heels don't go and my whole outlook for day to day fashion changed. I quickly learnt that I needed classic pieces in my wardrobe that had dual purpose that could be dressed up for the minimal times I was required to be my old-self. 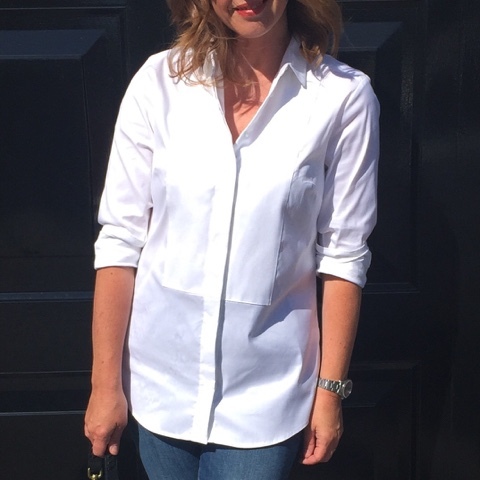 The wardrobe essential items have become the backbone of my wardrobe, the white shirt, a great fitting tee, a flattering pair of jeans, a 'go with everything' fabulous coat (adore this grey one) and the ever multi-functional leather jacket. I would have laughed at you if you would have said I would be wearing trainers with my daily outfits 6 years ago (at work I was the stewardess who never swapped into her flat cabin shoes, even during a busy 13 hour day I always kept my heels on), but as you know I have embraced them, they are a mummy essential item and Marks & Spencer have also realised this by including a very stylish and modern pair in two colour ways in their autumn/winter collection here, as seen in Vogue. 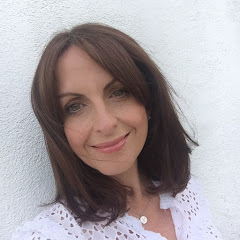 Marks and Spencer allowed me to pick 3 items from their new collection that I felt fit my age milestone, sticking to ageless, classic items that have dual purpose, I picked a white shirt, I feel a white shirt is a must in any ladies wardrobe. I love, love this shirt, classic bib front and perfect for us big busted girls with the added inner buttons to ensure no peeps and I can ensure you there have been no peeps! I wear jeans 99% of the time and finding reasonable priced jeans, of a flattering fit and of a good quality are hard to find, this pair from their Limited edition collection are amazing, high waisted to tuck everything in and a great frayed hemline, very on trend. 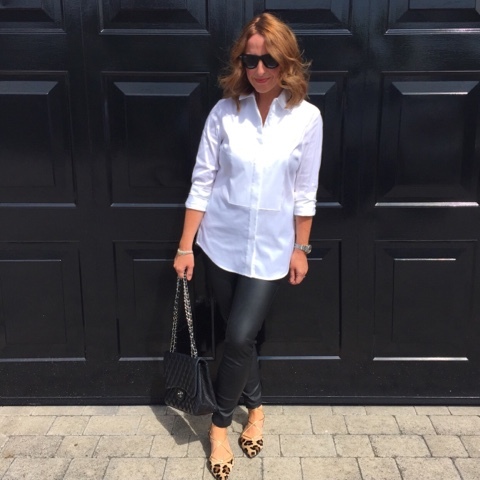 I gave this white shirt a whole different look and styled it with my leather look leggings, which is a perfect outfit for an evening out or a fancy lunch, you can purchase Marks and Spencer's ponte real leather leggings here, which may I add get amazing reviews. I find them surprisingly so multi functional, they are perfect for an evening, but they also look great during the day with winter knits and ankle boots. My third piece had to be a dress and I picked this amazing faux suede dress that will look perfect in the winter styled with my Stuart Weitzman over the knee boots and on a really chilly day I think it will look wonderful with a black polo neck underneath, very Ali MacGraw, sadly this dress is sold out in sizes 14 or below, but this almost identical one (here) is equally fabulous. 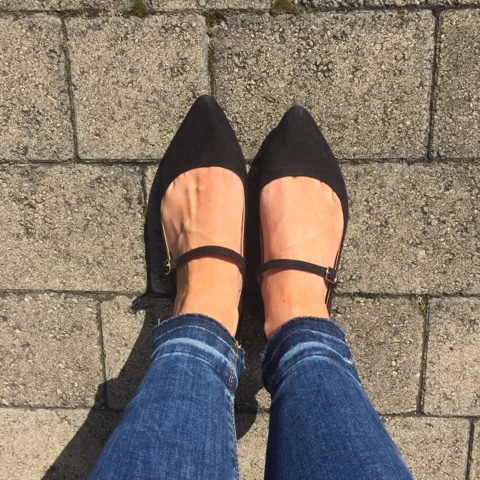 I have added my full list of my classic, mummy essential pieces that will take you through the milestone that is becoming a full-time mummy, but keeping your fashion mojo alive. This post was brought to you in collaboration with M&S. I love all your picks and I'm glad you managed to find a bib shirt in place of the JCrew one which you nearly bought. I look forward to seeing you in the suedette dress. I used to have one you know but I never had the guts to wear it. It was a little short and skimpy and I looked like one of the lady Flintstones in it. Honest. When you pull these pieces out of M&S they could be straight out of a high end designer!....Some fabulous wardrobe goodies that may now just go on my Fall shopping list! !